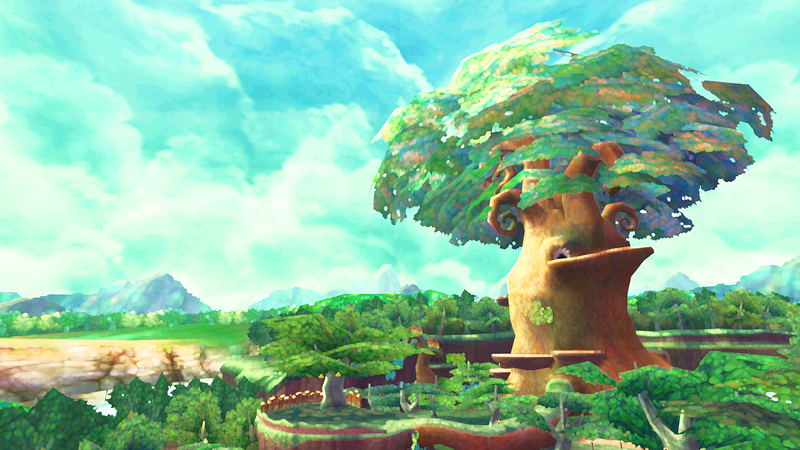 Miyamoto’s skill level and technical difficulties aside – what do we think of Skyward Sword? With glimpses at the game’s visual style as well as many of the new gameplay mechanics, such as sword controls and combat strategies, new mechanics for aiming, and a couple weapons never before seen in a 3D Zelda, there’s plenty to dissect. So let’s cut the crap and get down to the core of what we all care about. Looks like the rumors we posted yesterday weren’t totally unfounded. Skyward Sword combines the graphical texture style of Wind Waker and the artwork of Twilight Princess for an all-around awesome package worthy of the Zelda name. While some people may find the cel-shaded touches to be a step back, they’re probably a good sign that we won’t see any poor texture jobs as we did in Twilight Princess. The visuals stand tall and strong and are among the best we’ve seen on the Wii. What really impressed me, though, was the world design – stunning, much richer than any previously-seen title. In one particular shot, get a good look at the mountains, waterfalls, and sweeping landscapes in the distance, promising that this game’s world – Hyrule or otherwise – is one of epic proportions. Enemy design looks top-of-the-line in some places, uninspired in others. Deku Babas and Stalfos made a smooth transition and were redesigned in a very appropriate way that fits the new sword gameplay. The pig-like monsters (possibly Moblins, but who can tell these days), on the other hand, weren’t as impressive. Then of course there’s the new enemies, such as the giant scorpion boss (Gohma?) seen in the gameplay trailer and a nifty blend of a Deku Scrub and an Octorok. All in all, though, very excited about this element of the game – can’t wait to see more. The first and most obvious control point I’m sure anyone noticed was the sword controls. Link’s sword movements map closely to the Wii Remote’s movements thanks to the Motion Plus attachment. (Which will be included, right Nintendo? Right?!) 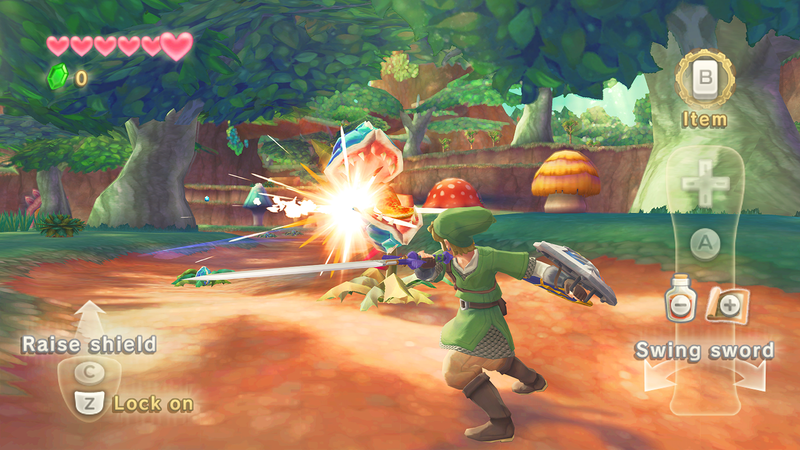 Link is once again right-handed to reflect the game’s focus on motion-controlled sword fighting. This time, there promises to be a huge difference between swinging horizontally or vertically – some enemies can only be defeated by slashing them in the appropriate manner. One good example is the Deku Baba – the way they open their mouths indicates the way you need to slash them. For anyone who was worried, Z-targeting remains intact, without detracting from the intuitiveness of the new sword controls. Longtime fans of the series rejoice! When Link raises his sword skyward, it charges it much like holding down the B button did in previous installments. 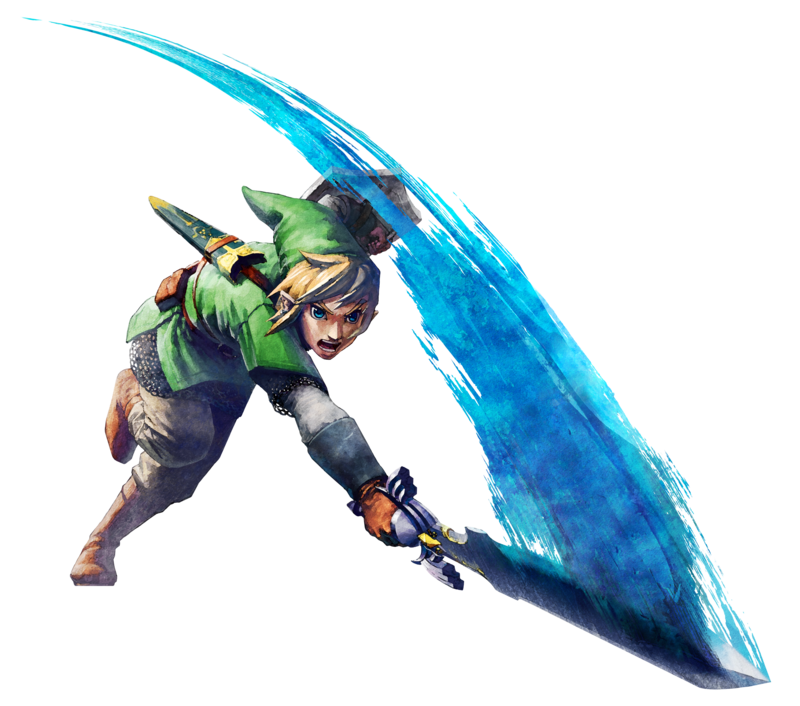 A fully charged sword unleashes a sword beam – an element long missing from 3D Zelda. Will it be used for combat only, or will we see it play a role in puzzle-solving? As the title implies, the sword’s connection to the sky plays a vital role in this game – but we’ll just have to wait and see. Of all the new features of the sword combat, though, the most refreshing is the activity of enemies. 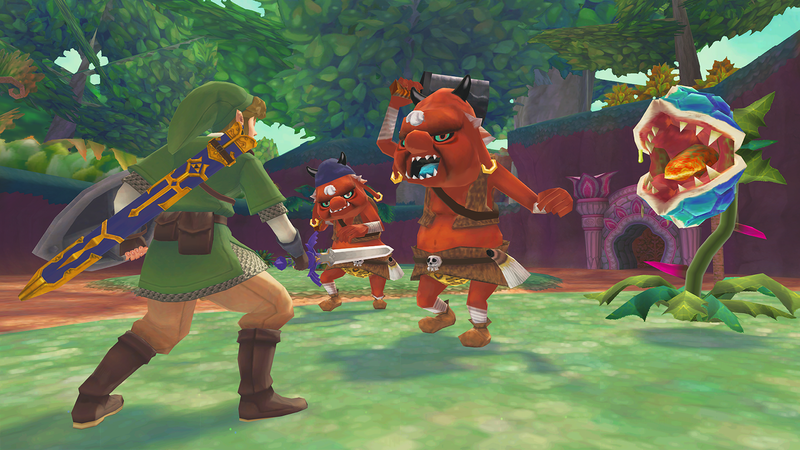 The pig monsters actually try to block your moves, shifting their defenses to match your sword moves. Very reminiscent of Zelda II, which can only be a good thing, as that game featured one of the most involving combat systems to appear in any Zelda game ever. The shield seems to be much more involved in combat than in Twilight Princess’s “auto-shield” format. Pressing the C button with your sword deployed raises the shield, which you can then use to block attacks or bash enemies and projectiles. We didn’t see much else regarding shield gameplay, but we did see Miyamoto repel rocks back at those Deku Scrub monsters during the demonstration. Classic. The “rolling attack” that first debuted in Ocarina of Time is out, and while there’s not a jump button as I originally predicted, I think Nintendo’s found a worthy replacement – now the A button is used to make Link dash. Nintendo only breezed over this in the demonstration, but suffice to say that I’m overjoyed that we have a more realistic option for faster player movement. As in Twilight Princess, the B button is reserved for items, which players select from a quick-menu derived from the same game. The slingshot returns, and this time players can aim it without relying on the Wii Remote’s pointer. This supposedly allows the Wii controls to emulate a real-life slingshot. On a similar note, the bow and arrow controls seem to have come straight out of Wii Sports Resort. Motion Plus allows for the player to hold the Remote upright like a bow and use the C-button on the Nunchuk to draw back arrows and fire. Arrows can also pin items like recovery hearts to surfaces for Link to retrieve later, which will almost certainly offer some interesting new puzzles. Bombs of course make a return as well, this time with a variety of new options. Players can see the projected flight path of their bomb before they throw it, allowing for a much greater degree of control and accuracy when using them. In the trailers, we also saw Link rolling bombs along the ground like a bowling ball, which allows them to reach areas that would have been otherwise inaccessible. One item that surprised many of us was the whip, first seen in Spirit Tracks last year. 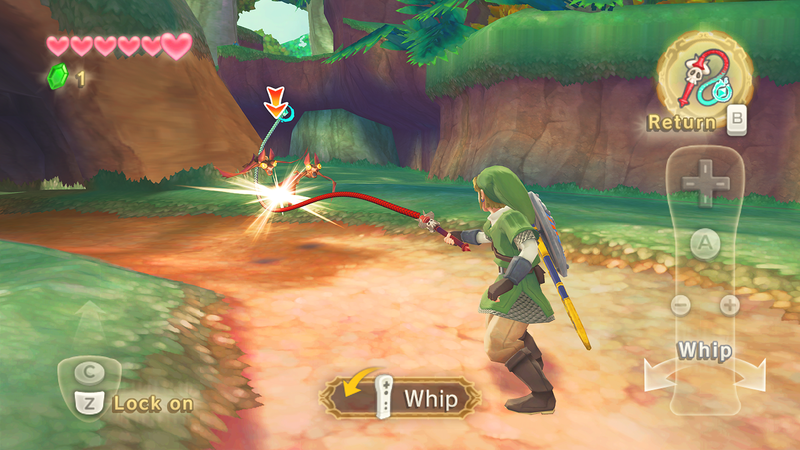 Like in the DS game, the whip can gather items as well as attack several enemies at once and from a distance. Not surprisingly, it’s controlled by careful swings of the Wii Remote. Since it already does most of what the Hookshot could do in previous games and more, does this suggest a case of “out with the old, in with the new”? Your guess is as good as ours! The one truly new item was the “beetle,” which functions similar to the Gale Boomerang from Twilight Princess in that it can pick up items such as bombs and carry them to a hard-to-reach destination. Link releases the beetle with the B button, and players guide it with the Wii Remote until it hits and obstacle or serves its intended purpose. Because of the malfunctions during the demonstration, it’s hard to go into much detail, but we’ll present more information as it comes to us. Other items like potions are accessed from a sub-menu, making them easy to use on the fly. Will this mean a greater level of difficulty as healing items become more accessible in the heat of battle? We can only hope. The verdict? An interesting set of enhancements that stick to the traditional feel, but that also add new twists that are sure to set this game apart from the rest. While details on the story are basically nonexistent – aside from a strong connection to the sky – you know us, we’re going to comment on it anyway. First point of concern – whatever happened to that girl from the teaser art last year? Wasn’t Link supposed to be missing his sword? Wasn’t this supposed to be the “big hint” as to the game’s setting? “Everything we know has changed.” And for those of you who read the E3 fact sheet we posted a little while ago, Nintendo doesn’t seem to be interested in commenting – at least not officially. As for the sword, Link’s weapon of choice is unmistakable – it’s none other than the Master Sword and Hylian Shield combo. Those of us hoping for a new sword and a completely different setting may have to put those dreams on the back burner once again. That’s not to mention that “Master Sword” has always implied “Ganon.” How we experience Hyrule, and how the sword ties into the story – and into the game’s “sky” mythos – had better be interesting, or Nintendo’s going to have to answer to a slew of rabid fans asking for their childhood back. Not much else to say here – Nintendo is being secretive as usual. And with the release date projected far off into the ether that is 2011, I doubt we’ll be seeing/hearing/reading anything on the subject anytime soon. I think we should place high hopes in Skyward Sword. The developers “back to basics, high-density gameplay” approach, combined with the traditional quality and appeal of the Zelda world, should make for an interesting ride. That’s not to say we should become totally absorbed in the hype, but we should be careful not to let our doubts overshadow the experience when we get to play the game next year.